Getting the iPhone would be the only reason I would switch to Verizon. IMO, their entire smartphone line-up is inferior. I'd rather have an iPhone on AT&T's crappy network, than have a crappy phone on Verizon's network. "But you can customize an Android."... LOL, awesome! "If someone is going to bash Android at least make sure you have used an Android phone for more then 10 mins." Yet you hadn't even put your hands on the device when you were running your mouth. Hypocrite. And in this case, please tell me how long have I played with an Android phone. Otherwise, you're talking out of the side of your neck again. can android sync automatically my notes/ to do list with my wife? thats the only real deficiency i find in my present iphone 3g, and mine is still better than the android this guy shows me.....compared to a 3g and i can't talk and surf at the same time. I'm on an Evo right now. And I own an iPad. And a ton of Apple stock. what kind of speeds do you get in real life? I agree. Apple's been pretty clear about the one-size-fits-all. I mean, if they were gonna make a CDMA phone, they would have bent for China as well, which was a 3 fold increase in market size. If they didn't do it for 450 million customers, I don't see them doing it for 80 million. Everyone says they have proof but no one thinks about philosophy. Is Apple really the company to make two phones and troubleshoot for both? Aren't they the ones that make one device that works everywhere? Besides, only Verizon uses CDMA. Not many other providers outside America use it. With 4G my average is around 4.2 in a solid 4G area. The one thing I like best about the Evo is is takes full advantage of my wifi which so far is the only smartphone that I can get to speed test over 20mbps. Also the Evo got Android 2.2 last week which has worked well so far. Also puts the Steve Jobs myth aside that Flash 10.1 can't run well on a smartphone. I mean, if they were gonna make a CDMA phone, they would have bent for China as well, which was a 3 fold increase in market size. If they didn't do it for 450 million customers, I don't see them doing it for 80 million. Are you just fraking with us by repeating this nonsense?
. The one thing I like best about the Evo is is takes full advantage of my wifi which so far is the only smartphone that I can get to speed test over 20mbps. The fastest I've been able to get on AT&T is 3.1 mb. Flash? Never heard of that one. 1) Do you keep 4G on all the time or only when you need it due to the battery drain? 2) Have you checked the testing and review sites to see what the max is for the EVO on 802.11g and n? From why I've read the iPhone 4 still beats other smartphones with 802.11b/g/n chips despite having a lower CPU clock by an estimated 25%. In any case, all are great for a phone in 2010. Brian Klug of Anandtech has retested using a methodology similar to ours. *They used PDFs instead of MP3s which might actually be better because iPhone?s web browser seems to be more aggressive at downloading. *They?ve now managed to get their iPhone 4 to pull 24 Mbps downstream in 802.11g mode and 29.6 Mbps in 802.11n mode. *That is as fast as one can expect from an 802.11g network but the iPhone 4 falls short of the 70-80 Mbps you can get on an 802.11n enabled notebook or netbook. 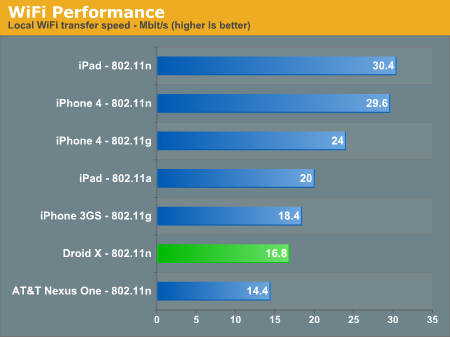 *However, the iPhone 4 seems to be much faster than the Google Nexus One in this round of testing. *The Nexus One only managed to pull an average of 14.4 Mbps in 802.11n mode and peak at 20 Mbps. 3) I'd like to see these tests of Flash running well on Android. EVERY review and demo I've seen shows it causing slow page load times, wonky page scrolling, and a major drain on your battery. And that's on 1GHz CPUs with 512MB RAM, but worst of all it's August 2010 and this promise of Flash on all smartphones (sans the iPhone) is still not even close to being a reality. When Apple is the only holdout an their is negliable page load times and battery drain then Flash can claim a victory, but seeing as Flash the desktop is still not capable of resving these issues I am not holding my breath. Absolutely wrong. CDMA is used by at least one of the Chinese networks and several other networks around the world. Nowhere near as many as GSM, but many millions of potential customers. "A Sprint CDMA phone should work in most of Central and South America and the Caribbean along with New Zealand, Indonesia, China and Taiwan, South Korea, India, Israel, Thailand, and a few U.S. territories." They are in the process of shutting down the NZ CDMA-One network. I know the 4G areas so I only turn it on when I know I am in 4G coverage. Depending on my location (distance from my router) I get anywhere from 15-22mbps on my Evo. However I will say that distance is sometimes an issue with the Evo, which I still believe if software related. My daughter has an iPhone and the best she can get using the same speedtest that I do is about 6-8mbps. Which really isn't a major issue if you are getting over 6mbps. I haven't had any load issue with Flash so far but we all know its demanding on the battery. The HTC update before 2.2 greatly improved battery life. With 2.2 the biggest issue was not Flash but a bug in the new facebook app which was causing a major battery life issue. For me its about having the option to live with less battery life if I want to view Flash content. Which has always been my issue with Apple in regards to the iPad. I see Flash issue this way. As Android continues to increase in market share Adobe will either wise up and continue to try and improve Flash or it will die on Android also. However to me its unacceptable for a multi function Tablet not to have the ability to run Flash. I agree with you when it comes to smartphones the hit on the battery may never be a valid trade off but I feel the iPad has the size to increase the hardware specs to make Flash 10.1 run well. Which may never be the case with smartphones due to size limitations. Here's the faster of 4 tests on my iP4. They were all over 10 mb download and 1.41 upload. Distance from the router didn't seem to make a difference! I can't find a WiFi performance test for the EVO 4G on AnandTech's site but this is has the Nexus One with Froyo. I have to assume it's been tweaked since these tests because that is pretty bad. PS: Froyo is an absolutely brilliant update to Android over 2.1 that I have some trouble believing those results aren't from 2.1. I've seen some users getting 5.x Mb/s on AT&T's network at times. Regardless, at these rates I don't think getting 3, 4 or 5 Mb/s on a phone isn't as important as the power it uses to access to make that happen. There is no '4G' tech that can even come close to the power efficency of HS*PA for a similar speed. Verizon will have the same issue, too. This gives AT&T and T-Mobile USA several years before they will have to play catch up to Verizon's network speed maxs for their handsets. I stand corrected: I guess AT&T has been working on their network. Is that on an iPHone 4? We don't have one yet. My daughters iPhone is a 3Gs. Flash now works on my Evo with 2.2 but like I was telling Solip its not exactly ready for primetime when it comes to smartphones. Battery takes a pretty hard hit when viewing Flash content. ATT certainly has a fast 3G network if you are in a good area. Living in Atlanta I have never had an issue with any carrier because the coverage is solid with Verizon, ATT and Sprint. I would say with 3g I am only around 2mb with my Evo. For me Android is just something I wanted to give a try. So far its been a mixed bag, some things I like and others Apple is light years ahead in my opinion. I can verify the iPad numbers are right there. I get about 29-32mbps using my linksys 3000 dual band router. Based on your chart I would say the Evo slightly above the iPhone 3GS using wireless g. I could be wrong but I believe the Evo has ability to use wireless N but for some reason the protocol is disabled. To turn it on you have to root your phone. However I have to say I have never seen our iPhone 3GS hit those numbers using G.
Yeah, that's the iPhone 4. My 3GS could only muster about 15 mb. I've gotten over 30 on my iPad. So what. Your refrain is old. And boring. Like DaHarder's. I think we can agree the iPhone is still best smartphone for the typical consumer and that you got an Android phone with their best OS release. Froyo is a very impressive upgrade over 2.1. I'm sure if that says more about how good 2.2 is or how bad 2.1 was but the end result is very impressive results that put Apple's JS benchmarks to shame. Other things are harder to directly compare.